The Prabhakar Post: Does Longterm Investing in Indian Equities make Any Sense? Does Longterm Investing in Indian Equities make Any Sense? I switched on the Television the other day and a well recognised 'analyst' was on air extolling the virtues of long term investments in the Indian market.Talk of investing now as valuations made sense from a 3-4year perspective. 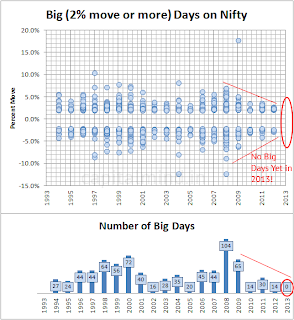 Weren't the same words used sometime in 2009?If you followed the Defty,which is the nifty in dollar terms the return for the previous six years is -8% against Nifty absolute return of 36%.Means that in the period 2007-2013 where Indian GDP doubled,Foreign investments trebled,most FIIs which invested in India got a net negative return in this period! 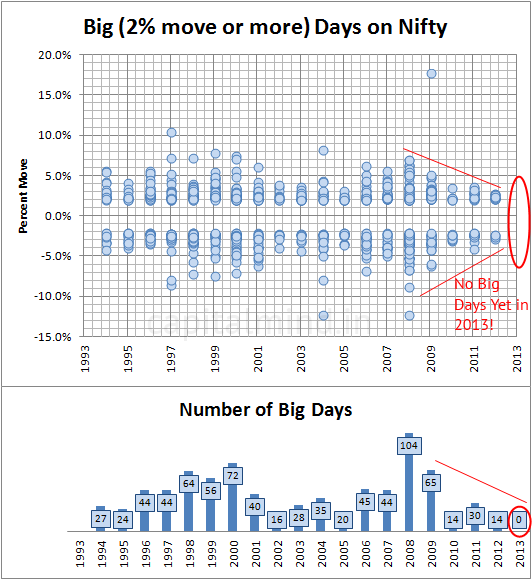 If we take the Nifty at its own value of 5 years previous and calculate the compound rolling returns since 1999,it works out to an average return of 12.78%.Note that the major part of that return is concentrated in the 2006-2009 bull period.The average past 5 years return is closer to 7%. Another Statistic:At current level of 6100 we are about 5% away from the all time high of the Nifty at 6300.If I adjust for WPI inflation(Note:WPI is substantially lower than CPI inflation) then we are around 44% lower than the highs.Amazing!! Those who have asked me in the past few weeks why their stock holding is in most cases 30-40% lower than Index value-I hope it satisfactorily answer your questions. Advise to Traders I have watched many traders and seen their clients lose money(more likely hemmoraege!! ).Too many are specialists in their functions or set in their way.Even with the rupee yet non convertible the international price movements coupled with currency volatility and Demand Supply data mix is leaving most clueless. Use the interplay between Commodities,Currency and equities to create positions that are flexible.Having in depth knowledge of sectors,political conditions and backing your beliefs is the need of the day...! Reason why I quote Lincoln and not Warren Buffett is my feeling that this moment in the investment markets across the globe belongs to the Hustlers!Too many variable-Growth,Inflation,War,Terrorism,Political instability.